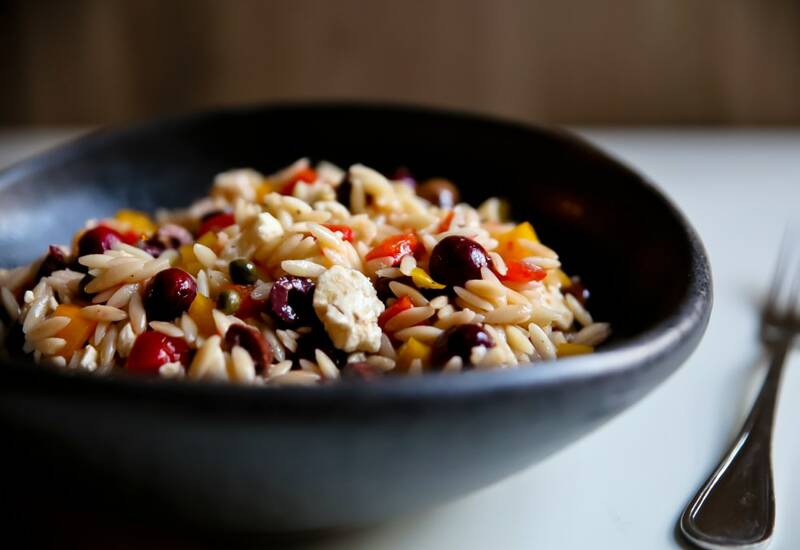 Orzo pasta is mixed with Kalamata olives, capers, artichoke hearts, dried cranberries, and feta cheese and then topped with a tangy lemon vinaigrette in this pasta salad bursting with flavor. Make this dish for a potluck or dinner party and your guests will be raving about it. Or make a batch on Sunday and have lunch ready for the whole week! Any type of pasta can be used in place of the orzo. Couscous or rotini would be nice pasta varieties. If you are looking for a gluten-free version, try substituting rice for the orzo or use a sturdy gluten-free pasta. Add walnuts or pecans for a nutty crunch. Top the salad with sliced green onions or chives for added color and flavor. Per Serving: 614 calories; 36g fat; 71.2g carbohydrates; 8g protein; 8mg cholesterol; 707mg sodium. I used roasted red peppers in this recipe instead of the red and yellow, raw bell peppers. I love the charred taste you get when they're roasted. Orzo is one of my favorite foods, and I was really please with the way this dish turned out. Simple and elegant.